Salama Nasib holds a bachelor’s degree in visual art from Zayed University. She has exhibited at local and international venues, including Zayed University, Tashkeel, and XVA Gallery, as well as at the Venice Biennale and The Printmaking Center of New Jersey. Nasib has established herself as a successful emerging Emirati artist, specifically in printmaking. She plans to continue her artistic training by pursuing a master’s degree at the Rhode Island School of Design as an inaugural recipient of a fellowship provided by the Salama bint Hamdan Al Nahyan Foundation. Nasib is currently a studio coordinator at Tashkeel, where she stays abreast of the latest Emirati art trends while managing seven studios, organizing artistic and collaborative workshops, and preparing current and upcoming exhibitions. Nasib lives and works in Dubai. In her works, Salama Nasib creates narratives using a metaphorical and surreal approach that capture viewers’ attention and makes them question what they perceive. In Bu Daryah, she depicts one of the many popular myths historically told as bedtime stories to children in the Emirates. These fables combine reality with the narrator’s imagination to convey specific messages. 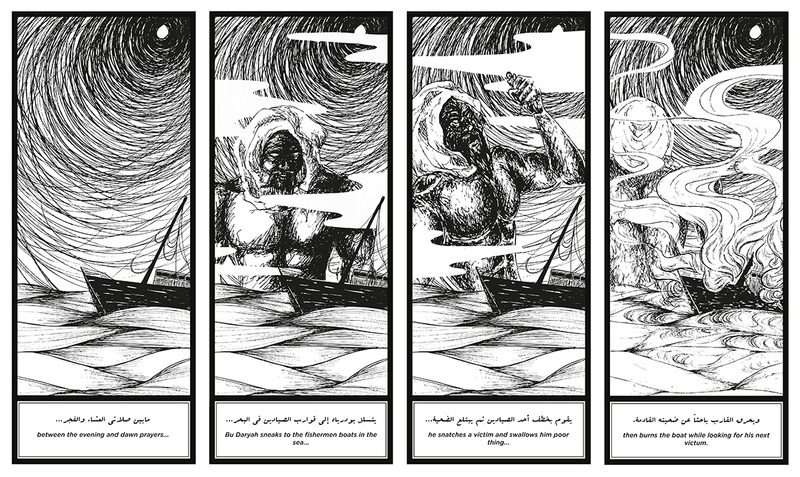 “Bu Daryah” is one of the famous legends of the sea, where the eponymous figure, a jinni, or supernatural being, haunts the Gulf waters and appears at midnight to abduct sailors and burn their boats. Because of this legend, pearling ships often placed men on guard duty at night to protect their crews from harm.